In April, Pet Food and Supplies prices got back on the roller coaster, falling sharply from March. 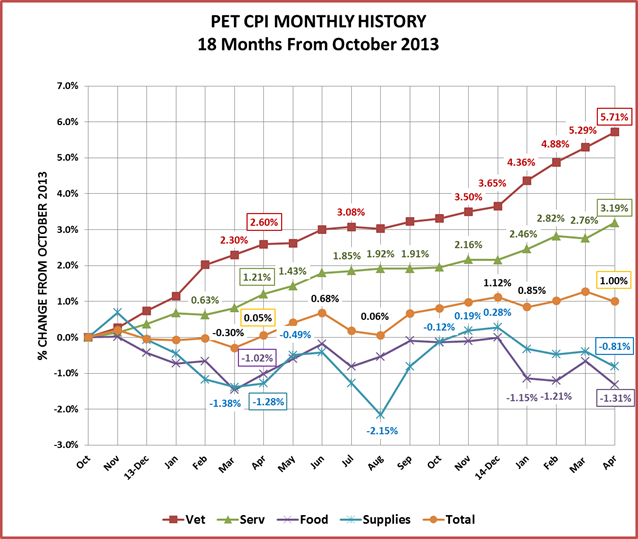 Like the situation in January, despite rising prices in Veterinary and Service segments, the April drop in Food and Supplies segments was enough to pull the Total Pet Prices down for the month and the year to date. Food was the big “driver” giving back all and more of the ground that it had regained in March. 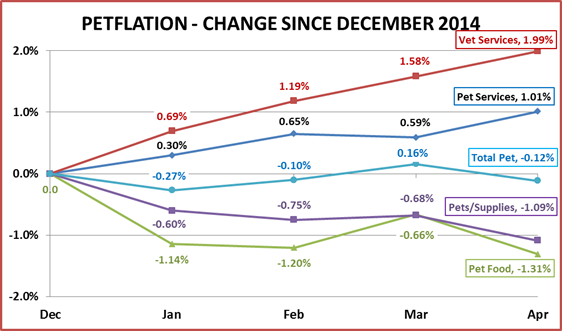 Veterinary continues its usual pattern of strong inflation early in the year (0.5% per month). Services are also on a relatively normal track with a low inflation rate over the first 3 months, then turning sharply upward in the April. If the usual pattern continues, both segments should see continued increases through the Spring, flattening out in the Summer months – starting in July. Remember, last December Food & Supplies had a price increase rather than the “drop” which had become the norm in recent years. The “drop” occurred in January so December 2014 was a little higher than we would have expected. Here’s what has happened in each segment since then. In 2014 February had an increase followed by a drop in March. In 2015 the increase and subsequent drop occurred a month later – in March and April. Food – April drop was significant…so is down 1.31% for the year to date. Supplies – prices continue to slowly fall. Veterinary prices continue their normal winter/spring increase. The NonVet Service segment continues to increase in price but at about half the rate of Veterinary. The Total Pet Market Prices rose in March due largely to increases in Food and Veterinary Services – the same “drivers” as in the February 2014 increase. Let’s take a look at the monthly history over the last 18 months to get a better feel for the “rollercoaster” ride in Food and Supplies. April of 2015 and April of 2014 are outlined so you can see where we were at this time last year. As we have noted, March was the pricing “low point” for the total industry in 2014. We are about 0.7% above that level this April. All segments but Food are above the pricing of a year ago. Even Supplies are up, primarily due to the residual effect of 4 months of continual increases from September through December. The big question is what will happen with food – the largest segment? Veterinary Services – Once again the price increase from December to April this year actually exceeded last year – up 2.06% in just 4 months. In our consumer expenditure analysis we saw that veterinary spending increased significantly – for the highest incomes. However, it dropped $1B for the <$50K group. Obviously, there is a cost associated with strong inflation beyond just price. NonVet Services – The price increases in this segment have been regular but more moderate than the Veterinary segment. It appeared that this had not affected consumer purchases. However, the recent Consumer Expenditure survey indicated an overall flattening in spending on Services. Flat spending in conjunction with increased prices indicates a reduction in the amount of services purchased. 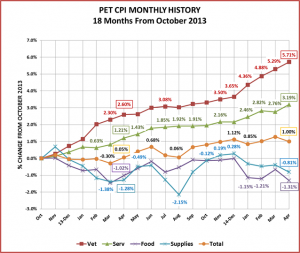 Pets and Pet Supplies – Prices are actually 0.5% above April a year ago. However, they are still 3.8% below what they were in April 2009 – 6 years ago. The deflation in this segment is a slow, ongoing and painful issue, with no easy fix. I know that you are all tired of hearing me “preach” about this. However, long term deflation is a serious issue and in many ways harder to handle than inflation. When popular categories become commoditized, price competition drives down prices and ultimately drives out some manufacturers. The only real cure is to innovate – make it better – that’s how you can get today’s value conscious consumer to spend more. 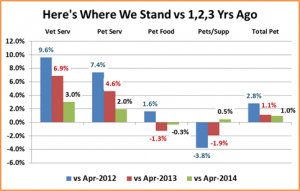 Pet Food – This largest segment is becoming a serious concern. January saw the largest price drop in 17 years. March brought a strong uptick in prices. Then another big drop in April took away the ground regained in March…and more. 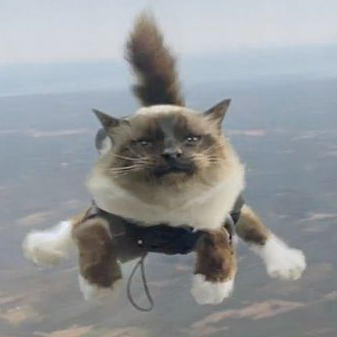 The Consumer Expenditure survey indicated recent Pet Food Spending is down about $80M. With the deflating prices, the actual amount of food purchased remains at 99.9% of the previous measuring period. It’s a complex story. The >$120K households are spending more on Food. Everyone else is looking for a value and spending less. Total Pet Market – It’s a “bipolar” situation. Veterinary and Service segments keep going up. Supplies and especially food are trending down. History says all segments should have increasing prices through June. Then Total Services flatten out and Food & Supplies drop in the summer, dragging the Total Market down. 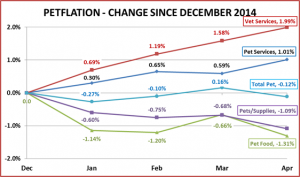 We’ll see…We seem to be on track for an overall CPI increase of about 0.66% for 2015. The Food & Supplies segments are still on a pricing Roller Coaster ride. We’ll keep you up to date!